For those of you who don't know, Hemopet is a presumably non-profit animal blood bank holding 200 greyhounds in California run by Dr. Dodds and her husband Charles Berman. We have issues with greyhounds that are held captive after racing to be blood donors. It is certainly bad enough that they endure the trials and tribulations of greyhound racing. When they finish their racing career they should go directly to a place with a big soft bed to have a good life. Hemopet we have found in the past has taken in greyhounds from adopt programs such as GALT, Greyhound Adoption League of Texas, and others. In some cases the owners of those greyhounds have not given permission for their dogs to be blood donors but rather to be adopted. Although in 2009 we submitted evidence of misrepresentation and the state of California simply looked the other way. Hemopet changed its website so it no longer includes tattoo numbers which made us able to find the greyhound owners. If you visit our website under 'Advocacy' you will find extensive articles and back and forth letters between Hemopet and NGAP. Hemopet recently was able to have legislature passed where they avoided paying sales tax on the blood that they sell. Instead, they have to pay a total of $90,000 in previous sales tax. They are currently seeking people to pay that $90,000. Their last financial statement showed revenue of 3 million dollars and a loss of $200,000. Presumably, Dr. Dodd nor her husband receive salaries and they probably have had to make loans to Hemopet over the years that still remain unpaid. I question if Hemopet is still taking in greyhounds without owners' permission. I question the care that they are given since although they do adoption, there is no transparency relating to the number of dogs that come and the number of dogs that go. No one is permitted in the back room where the blood is drawn and no one see the records of how often blood is drawn. Both adopters and former employees have suggested that the quality of life of those 200 greys is not what is should be. I would think really hard before I gave any of my hard earned money to Hemopet and also ask the state of California to look a little closer at what goes on there. NGAP is not opposed to blood donors. Blood saves lives of both people and animals. It just so happens that the University of Pennsylvania has what I believe the best blood donor program in the U.S.. They have a bloodmobile that goes to different areas on a regular basis to harvest blood from pets who then get a special treat and have free blood available to them for the rest of their lives. Most importantly, the donors go home and sleep on a soft bed with their owners knowing that they did something good. If you need to have a blood donor program just as we do with people, do it without captive blood donors. 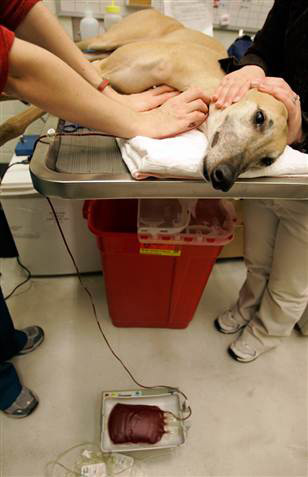 There is another greyhound blood bank in Texas called Pet Blood Bank. Look them up, it's almost impossible to get any information, to find their address, to see how their greyhounds live. When you donate to NGAP, and this is not a request for donations, we try to be the voice of those greyhounds that cannot speak.